Depression and food unfortunately results in unhealthy eating choices. People with low self esteem often use food as a way to stuff their feelings of inadequacy and depression. The type of food you eat can raise or lower your serotonin levels- a chemical in the brain that makes you feel good and can have a lasting effect on how you feel throughout the day. Serotonin is made in the brain from the amino acids tryptophan. The more serotonin - the better you feel. Foods that are high in Omega-3 fatty acids can aid in fighting depression because it helps to raise low serotonin levels and lift your mood. Some of these foods are fish, walnuts, ground flaxseed, and canola oil.- Certain fruits such as cherries, orange, kiwis, pineapples, plantains, plums, tomatoes may help raise your serotonin. Low blood levels of vitamins B6 and B12 and Folic Acid can also make you feel tired and depressed. Taking a vitamin B complex can give you more energy particularly if you take it when you are feeling tired. 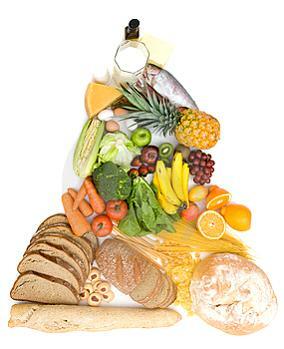 Choose to eat whole grains, fruits and vegetables instead of white bread, chips and candy. Making these choices will improve how you feel about yourself. Eat a healthy breakfast within 1 hour of getting up. Experts say it is the most important meal of the day. Studies show that eating a morning meal improves your memory and energy through out the day. Eat multiple small meals through the day. Eat every 2 or 3 hours. Eating through out the day will sustain your energy and mood. Plan ahead. Have healthy snacks with you in the car or in your purse so that you will not be tempted to eat junk food. We recommend keeping a bag of raw almonds in the car. Substitute whole grains for white carbohydrates. Exercise for 30 minutes 3 to 4 times a week. Exercise releases endomorphins, a chemical in your brain that makes you feel good. Start each day with the intention to eat healthy. Pick an affirmation from the list below or make up or own. Repeat the affirmation to yourself through out the day. I eat for nutrition not for boredom. For specific information about emotional eating , we recommend visiting this Help Guide Site. Be notified of updates to Depression and Food -Click on the RSS Feed on the Menu Bar.